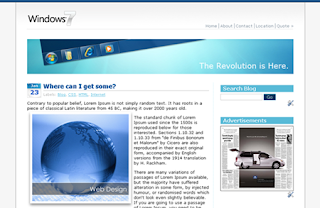 I am almost done with Windows7 Blogger Template just a final word for people who want to use this. One point people who are applying this template must note that the date setting should be changed to mm.dd.yyyy ( as mentioned in below image) else calendar beside post title won't work. You can post here issues or suggestions, if any. 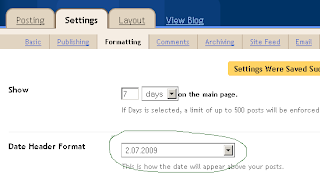 May I know how to make every entry, even they are published within the same date, has the calender in the very beginning? Which part of CSS or xml should I modify? The mm.dd.yyyy is the US format of date. In Europe and Asia this will be difficult to accept and remember. Thanks for sharing! Tejaswini - The date setting is required to display calender beside the title, so it hardly matters on which part of the world it is being used. Have a look on the demo and you will be able to understand the purpose. how about Archive Index Date Format and Timestamp Format..
Any ideas when this theme will work with BE 1.6.1?